Spa inspired master bath where a wet room delivers space and luxury with ease. Floor to ceiling glass panels create a boxed in wet room oasis, complete with a cast concrete soaking tub and two shower areas. The back-to-back spaces are divided by a wall sheathed in etched stone tiles. On one side is a floor-mounted Pipe shower fitting from Boffi and, on the opposite side a ceiling shower unit. With its steady rain-like stream and expansive windows views, there’s no doubt the showering experiences are spectacular in this wet room. The wet room has a window wall which includes a built-in bench below the windows. That wall is also tiled. It’s not often to see so much space dedicated to a master bath, but this extraordinary bath is in a 17,000- square-foot house in Miami, with room to spare. As the home features a sequence of courtyards that take advantage of the sky, water and trees, privacy is not an issue in the bathroom. The sink vanity is composed of a Macassar ebony shelf, pierced by a pair of Boffi I Fiumi sinks — you can catch a glimpse of the egg-shape bottom underneath. The stainless steel Cut wall mount faucets repeats the counter’s horizontal line. A minimalistic mindset continues with the floating frameless mirror and Crystal Sphere wall sconce from Alison Berger Glassworks. An ebony island [top] offers storage nearby. 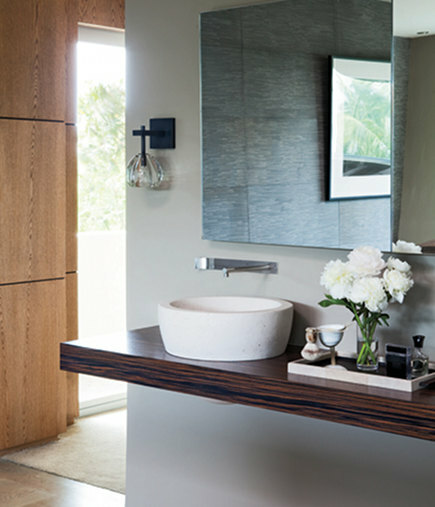 This elegant modern bath isn’t only open to the outdoors. The wall of onyx [below] is the back side of the sink wall which partially conceals the bath from the master bedroom. The end result is a handsome spa bath styled with restraint where quality materials are given the space to breathe on their own. It’d be like showering in a store display case! ;-D That is some bathroom….Beautiful and not too glitzy for the luxury of it all. I’m liking this trend toward doorless room separation. With that much square footage, I think I would’ve opted for a doorless type of shower, too. In my dream house, I think I will put more space in the master bath than in the bedroom itself. When it comes down to it, we sleep in there so we need room for a bed. A bath/dressing area is where I need to stretch out. This is great inspiration! There are some lovely concepts there, gorgeous. Widh I had the available space for such a centre piece to the home, as Marthacile commented ‘one can always dream’.